Since the mid-1800s, scientists understood that cells are the basic units of the body and that they generate other cells. Cells of the human body are all wonderfully specialized for what they do and they cannot do anything other than that. Stem cells do not have a specialized function. Being an immature kind of cell that retains the possibility of developing into many different kinds of cell, stem cells also have the capacity to keep multiplying. This capacity to proliferate and form different types of cells makes them ideal for replacing tissue that is lost. 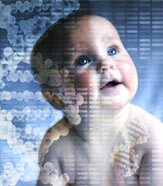 Stem cells are plentiful in the early embryo and are also found in adult tissues. Stem cell therapy aims to repair damaged or diseased body parts with healthy new cells provided by stem cell transplants, and can be used to treat different types of cancer, various blood disorders, disorders of the central nervous system (CNS), heart disease, diabetes mellitus, spinal cord injury. Until recently, scientists did not understand the molecular processes that afford stem cells such unique attributes. Now, master regulator genes that keep embryonic stem (ES) cells in a state of youthful immortality, have been discovered. These genes encode transcription factors that coordinate the activity of other genes so as to allow stem cells to multiply limitlessly while retaining their ability to differentiate. Understanding stem cell biology can help in developing new therapies for many disorders and in making them safe to use in humans. Key words: Embryonic stem (ES) cells, Adult stem (AS) cells, Progenitor cells, Endothelial cells, Stem cell biology, Stem cell therapy.